Summer finally feels like it's here in force. All the early summer rain ruined the snap peas in the garden and killed the peonies I'd been looking forward to all year before they even had a chance to bloom. But then the English peas started arriving and along with them, early lettuce, kale and garlic - and summer dining kicked off. My favorite salads have lots of texture and a zippy dressing. Washing and drying lettuce is tiresome: I love to use other ingredients to avoid the work of preparing lettuce and vary the menu. Lately I've been loving chickpeas in salads. The secret is to avoid the slightly slimy overly plump canned variety and start with dried, soaking overnight and then simmering until just tender so they are still a bit firm. Seasoned well, they have wonderful flavor and great texture. They also add easy protein to the salad. 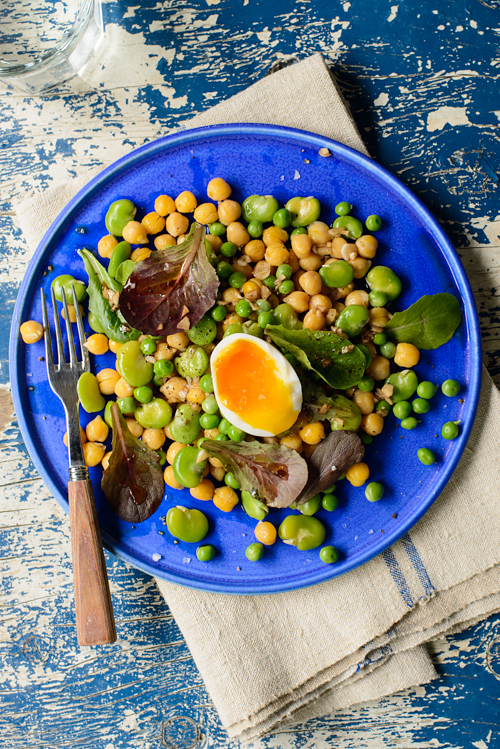 A salad I've been enjoying lately is is a pea/bean combo of chickpeas, English peas and fava beans. The latter is a bear to prepare but done in stages, the prep is not so bad and the reward is great. Dressed with a simple garlic/vinegar/olive oil dressing, plenty of sea salt and fresh black pepper, the salad is terrific, and keeps well even when dressed. Some nice additions: a handful of baby lettuces, a mollet egg to turn it into a hearty standalone lunch, some chopped shallot, a shaving of pecorino, a sprinkling of fresh herbs (Italian parsley and chive are my favorites). After a week of this salad, I keep thinking I'll tire of it, but I haven't yet. Prepare fava beans: remove beans from pods and boil in salted water for 60 seconds. Shock ice water. Remove beans from waxy outer cover by piercing cover with your thumbnail and squeezing bean out. Combine fava beans, English peas and chickpeas. Combine dressing ingredients and dress pea/bean mixture as desired. Season generously with salt and pepper. Taste and adjust seasoning. Gently mix in lettuce. Sprinkle with herbs or cheese shavings if using (and/or top with mollet egg). It still doesn't really feel like summer has arrived here yet.. It keeps hesitating and pulling back after we've had three days of summer... Forecast says it should be summery next week so fingers crossed! But even if the weather is bad, I think I'd go for this salad! Hermosa su ensalada saludable y fresca es irresistible,hugs,hugs.